1. You want to save some money. 2. You are a masochist. 3. You are an experienced and enthusiatic diyer. 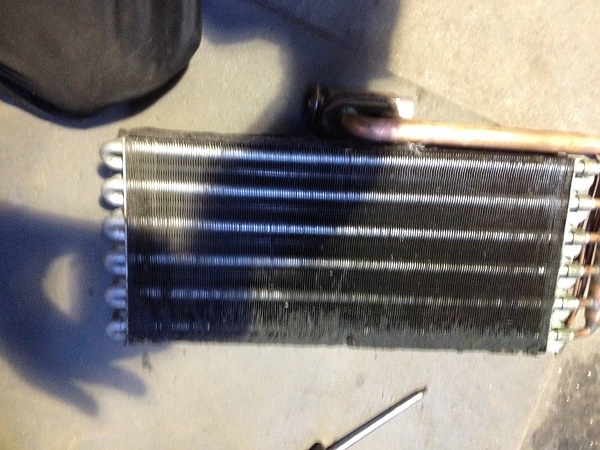 If you are replacing the evaporator do the valve block and fans at the same time. Shop aroung for parts. It's worth taking time to find the best deals especially for the fans. A full Aluminium evap is recommended, the serpentine model from Griffiths in the States is highly thought of, $599 inc valve. You will also need a dessicator. Tools:- A long handled magnetic #10 Torx is a must. Stubby ratchet, magnetic wand, magnetic tray flexy jubilee clip tool. Petrol siphon, cans, large funnel or tun dish. A decent torch. All the rest you should have, if you haven't you're not ready for this. Although the pcar/Pelican write ups were a great help. There are several important differences to a rhd 993. It's a time consuming and fiddly job. I will edit this post when I have a bit more time. It's a 2 handed job to be done in a dry well illuminated garage . I would not attempt this solo or outside. Take notes and photos as you go along, organise screws and fittings. Take your time and dont break anything. One major difference in splitting the heating unit were 3 torx, one well hidden down a deep recess, probaly well rusted, we had to drill the head off. The flexy pipes at the back of the unit are secured by almost inaccessible jubillee clips. If you are taking it to an indie you can do quite a bit of simple preparation to ease the bill. Remove the radio, lower dash, passenger seat helps, grill vent, frunk carpet and run the gas as low as poss ( a full tank will make you most unpopular) and source the parts yourself. We are nearly there, evap back in. Waiting for fans to arrive. 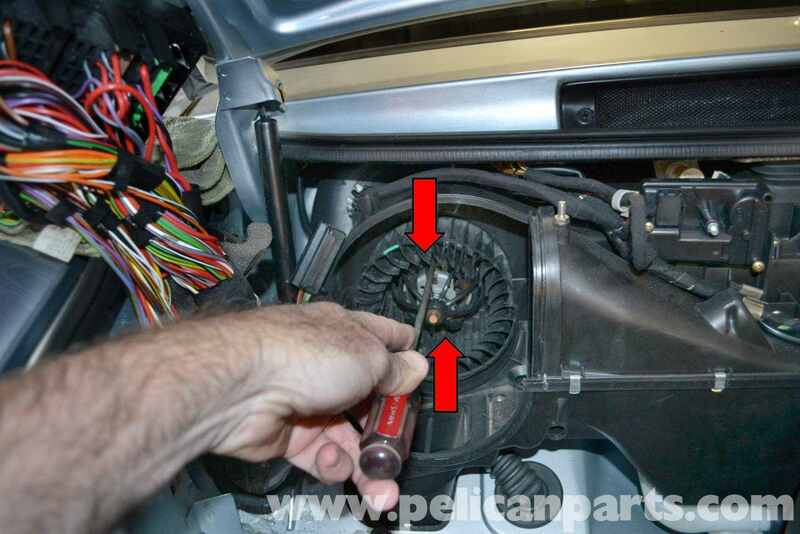 The yellow arrow shows location of flexy to airbox jubilee clip. Double jointed wrists and the ability to see round corners would help. The fans are not difficult to remove when you know how; remove the 2 torx, found by rotaing the hamster wheel until the notches line up, then with a long fine flat blade screwdriver @ 12 o'clock push twist and press down on the cage, you will feel and hear the plastic retainer disengage, then with your third hand do the same @ 6 0'clock and the fan will waggle out.Pic from good article on Pelican. Fans in but quite a struggle, spade contacts on fans had to be bent and when in, fan was fouling at the back. The squirrel cage had to be moved forwards about 1mm to clear. Everthing is tight clearance and stiff to manouver. It's baffling how the whole thing was assembled initially. Brushes and bearings on old fans well past it. Firewall back in and fuse box. Just the tank now and then new dessicator and regass. This is the worst job I've ever done including complete rear end rebuild on the 993 and torsion bar replacement and reindex on the 944. Blimey that looks like an I wish I had never started this job if ever I saw one. I hope it all works when finished. Well done for hitting it yourself. One of the worst problems is by using non OE parts the tolerance of fit can be slighly out. The condensor is a fraction taller and the valve block slightly out of alignment which made fitting the pipes difficult, nothing a bit of brute force (controlled) couldn't manage. The fins got a bit crushed at the top and the condensor valve block needed twisting a bit. The spade connector tangs on the fans had to be bent with refence to the old ones and when fitted the squirrel cages were rubbing the housing at the back. It all adds time and frustration. The rest is pretty straighforward as no new parts are to be fitted. 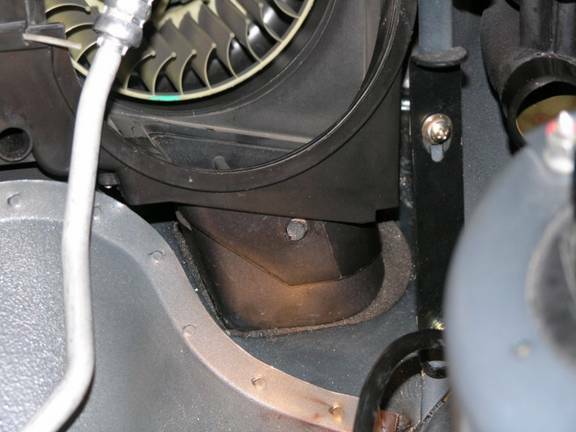 1.If you need to siphon petrol on rhd the expansion tank has to be removed so that you can get the fuel level sender out. 3 bolts and 3 hoses. one is accesible when you lift the tank. There is a jubille clip hidden inside a rubber bung don't bother with that one the other end is easier. 2. Remove the fuse tray and tie out of the way over a well protected wing. 3. Unplug the connector top middle of the firewall easier than unbolting the gigantic heat sink and loosing the nuts and washers. 5.Remove firewall, screws are mainly obvious. 6. You can then remove pollen filters and fans. It would then be nice to let someone else take over because the rest is a real pain and does not follow the walkthrough already published for a 964. We found it best to completely remove the air box so unplug and remove drain pipes after noting the arrangements, photos, sketches, notes, lables. Unplug electrical connectors and cable clips. 2 set screws 10mm hex head behing intake grill, 1 vertical one behind dash just above the 2 10mm brassy nuts behind the radio and ccu. 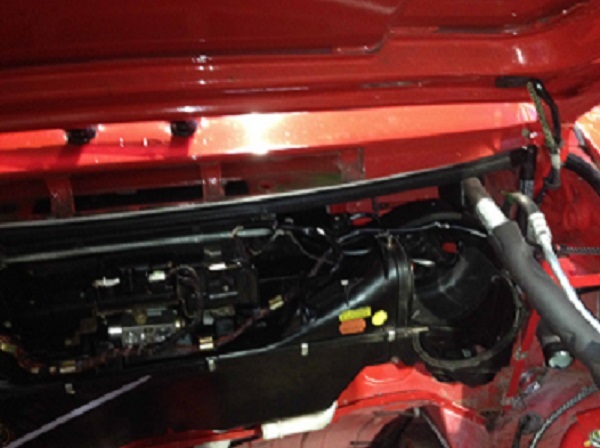 Remove a/c pipes and tie to bonnet hinge. The air box should now be loose but the footwell vents and flexy to side vents need to be disengaged. The rectangulat section footwell vents are retained by snap fit buttons, push the front button in, jiggle and prise to release then carefully push them down, not by the plastic bar. Ease the air box forward a bit n/s first and undo jubilee clip holding flexy very tricky to get at, then other side. Access may be obscured by a scuttle support bar. You can remove the top bolt and slacken the lower so they may be twisted to one side, no photo but you'll soon spot it. Go and have a brew you deserve it before you tackle splitting the air box. much easier with it on the floor. The fans were from Eurocarparts at a good discount through Jim@Chill Out, list is £317 each I don't want to be quoted on what I paid. but Design 911 have them @ £125 or £614 for OE. Yes the 190 uses the same motor but it fits LH side only and the cage needs swapping, it ran be modified to fit rh. and comes in @ around £50. 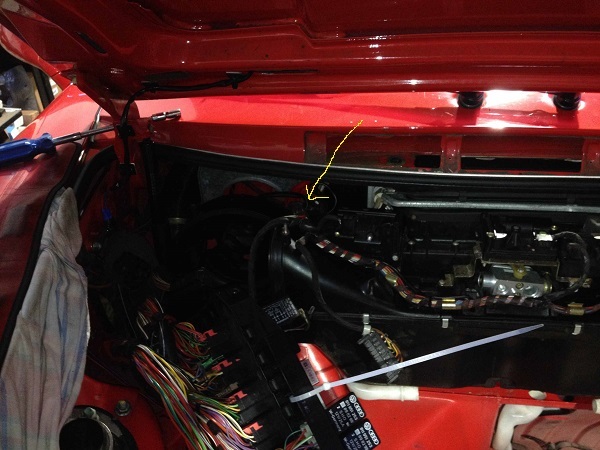 Jim had done a 964 previously and has a 993 himself but isn't keen on doing another one. The graphite fix may work for a while but as the bearings are sintered when they squeal they are done and my brushes had little life left. On reflection I'd go for the OE fans and the Keuhl evap from Griffiths. I'm a bit worried that these fans won't last for another 20yrs. Who is your indie? I'll let them do mine next time. Great post.. I was at 9E yesterday and have problem with my air flaps servo in footwells and a tech their explained it could be a stuck condenser fan etc so Il get into it.. maybe.. looks like a headache!!? 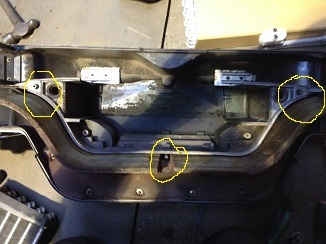 If it is your footwell air flap servo's they are a really easy DIY - took me about 30 mins and I'm no expert. The servo's were expensive enough without labour charges! There are plenty of step by step guides on forums. Yes, Im looking for the pics on how to fix the flap! All done and working cost around £1100 inc parts and labour. Many thanks to Jim @ Chillout, Bretherton. Not a job either of us want to repeat until his goes. Did you do this up at Jim's place? Has he still got his RS Clubsport rep? Yes, Jim still has the Batmobile, now with a nice set of RUF wheels, his was made a few weeks before mine in the same Guards Red (sisters). He sold his blue car a while ago and still reckon's the techtronic was a faster car? One of the cages is catching the back of the housing slightly so I'll try easing it forward a bit in situ with my little puller, otherwise all good.